Englishman Mike Ford is hoping to help Germany’s players realise their dreams and give them memories that no amount of money can buy. In the past, Ford has worked with some of the game’s highest-paid stars during spells with England, Toulon and Bath, but he admits that you couldn’t put a price on what qualifying for Rugby World Cup 2019 would mean to his squad of mainly part-time players. 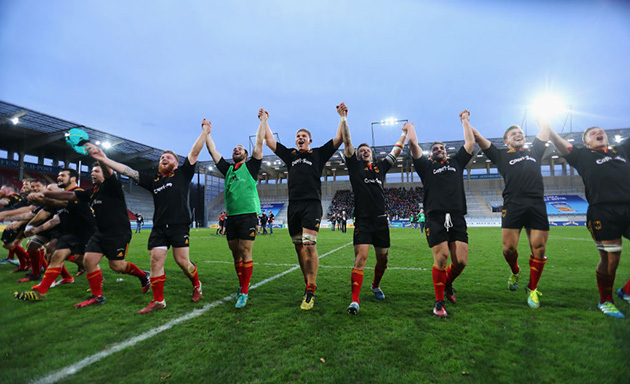 Next month, Germany will compete with Hong Kong, Canada and Kenya at the global repechage tournament in Marseille for the last ticket to Japan 2019 – and a once-in-a-lifetime opportunity to come face-to-face with the Haka and the All Blacks. 1. Germany won a rugby silver medal at the 1900 Paris Olympics. Three teams contested the tournament – the French national team, FC 1880 Frankfurt represented Germany and Moseley Wanderers represented Great Britain. Only two games were played, with France beating Frankfurt 27-17 and Moseley 27-8. France took the gold medal, with Germany and Great Britain each awarded silver, although some claims Germany deserved their medal outright, due to points differential. 2. Many of Germany’s top football clubs actually started out as rugby clubs, including Bundesliga outfit Hannover 96. 3. The German national team first played in 1927, losing 30-5 to France. Before the outbreak of World War II, they established themselves as the second-best national side in mainland Europe, twice beating the top-ranked French.